SEATTLE – Aaaaaaand that should about do it. It isn’t official. It isn’t in writing. But after a 45-minute tango with Oregon State, the Huskies are a virtual lock to go dancing later this month. The win wasn’t the proverbial clinic Washington has been putting on at home, but it was enough to boost its resume to a near unsnubbable standard. UW is 24-6 overall, 15-2 in the Pac-12 and four games clear of anybody else in the Pac-12. It is 15-0 on a home court that has become one of the loudest venues on the West Coast. You won’t hear players celebrating anything beyond Wednesday’s 81-76 overtime victory over the Beavers. And you won’t hear coaches talking about anything beyond Saturday’s regular-season finale against Oregon. But for any Husky fan who caught a case of insomnia after last week’s split in the Bay Area – which included a loss to worst-in-the-conference California – feel free to sleep soundly now. Before Wednesday’s game, ESPN’s Joe Lunardi and Sports Illustrated’s Michael Beller had Washington as a No. 8 seed in the NCAA Tournament, while Fox Sports’ Howie Schwab had it as a No. 7. The Ken Pomeroy rankings had the Huskies as the 36th-best team in the country, and they were 22nd according to RPI. Still, as CBS college basketball analyst Jerry Palm pointed out earlier in the week, the Huskies are dominating a disrespected conference and lack a signature nonconference win. But after beating Oregon State and ensuring it will win the Pac-12 by at least three games, any snubbing scenario all but evaporated. 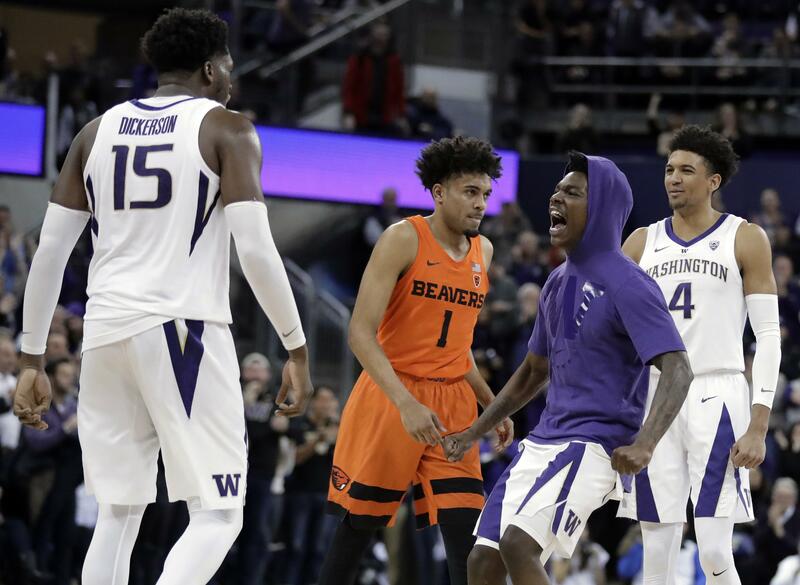 Of course, had OSU’s Stephen Thompson Jr. made his last shot in regulation, the mood on Montlake would be entirely different. Had that 3-pointer in the final seconds of the second half dropped, Dawg fans would be filled with anxiety instead of anticipation. Suddenly, a defeat at the hands of Oregon on Saturday would make Washington losers of three of its last four heading into the Pac-12 Tournament. The nightmare spiral reminiscent of last year’s late-season decline would have seemed at the very least feasible. But these Huskies have distinguished themselves from any of their predecessors over the past few years. The grit that has prevented them from losing two straight games all year was on display again Wednesday. When Thompson’s miss sent the game into overtime, Washington ensured its seniors’ final home game Saturday would be one of celebration instead of trepidation. And now, barring an unthinkable oversight by the selection committee on March 17, the Huskies will be back in the NCAA Tournament for the first time since 2011. Wednesday likely raised Hec Ed’s collective heartbeat to its highest level all season. Despite the Huskies leading by nine at one point in the first half, Oregon State consistently responded with a slew of stops and lead-closing 3-pointers. Tres Tinkle scored a game-high 31 points while tallying 10 rebounds, but like they have done so many times this year, the Huskies boosted their record by sharing the wealth. Big man Noah Dickerson had his best game of the season, scoring 22 points, grabbing 17 rebounds and dominating the extra period with seven points. David Crisp added 22 points on 7-of-9 shooting, including a 3-pointer to put the Huskies up five with 49 seconds left. Matisse Thybulle got his customary four steals and two blocks to go along with nine points. And Jaylen Nowell – Thybulle’s primary competition for Pac-12 Player of the Year – added 18 points, five rebounds and five assists. Wednesday marked the third time the Huskies took the Beavers to overtime in two seasons, and the first time they came out ahead. But they weren’t quite tough enough for a Washington team that has plowed through the Pac-12 in a way few could have predicted. Even former Huskies coach Lorenzo Romar, who has long been bullish on his former players, admitted to being surprised by UW’s conference record. But prestigious as a Pac-12 title may be, the ultimate reward is the NCAA Tournament. No player on this team has had the opportunity to play in it yet. That stage is a fantasy for just about any kid who has shot a ball in a driveway. And after Wednesday’s win, that fantasy is all but assured to become a reality. Published: March 7, 2019, 2:59 p.m. Updated: March 7, 2019, 4:44 p.m.